My friend's dad was not feeling well,having "cold sweating"
and feeling of heart discomfort for more than 20 minutes few days ago. 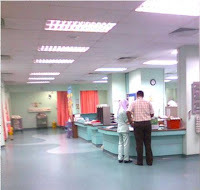 He spoke to his cardiologist over the phone and he advised him to admit to the "Trauma and Emergency Ward" of University Hospital, Malaysia. 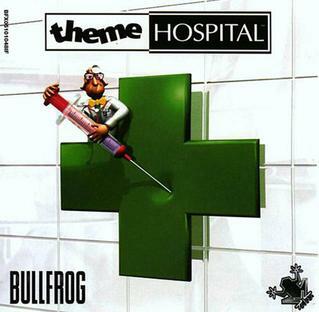 Well, this is a government hospital. If you are not happy, you can switch over to a private hospital, in which you have to pay for rocket-high fees. So in total you need to wait for MORE THAN 5 hours to see a doctor in the EMERGENCY ward regarding HEART problem? Otherwise, looks like we, as tax payer, have to continue to waste our precious time to see a doctor in the government hospital. it's like that.. that's government hospital.. In sarawak general hospital(SGH) u have to wait even longer.. last time i go for HRCT scan in SGH.. because i'm medical student that's y i can do the next day.. if not have to wait at least a week after.. the radiologist told me.. a week man.. if really got something then it's too late already..
yeah, there are too many patients, so would need to wait for quite some time. But usually the ECG would detect any problems first, and coupled with the blood test for heart attack markers (Troponin and creatinine kinase). If there is really a serious problem from the 2 tests(signs of possible imminent death) you would have to be admitted and treated immediately. If there's no imminent danger, they'll let the patients wait cos most patients also have problems of similar severity if not worse. It's partly due to lack of doctors. And partly cos of lack of communication from the hospital management. Yea,i think lack of doctor is the main problem since the doctor also agreed with my friend's dad. She even told him she don't mind her name to be mentioned if someone posted the article about this problem. Perhaps they should really look into this when their own doctor also realize the problem. UM is not totally gov hospital, they are semi-gov or am I wrong? They charge a high fee too. I went there a year ago and decided not to return any more because although they charge a high fee the service is no diff from a GH. themself and their relatives fall sick ? last time i got snatched and the result from that, i got really bad injuries. was really bleeding badly, and i had to wait for 3 hours at the emergency ward before a doctor attended me (i didn't even get a nurse to stop my bleeding st), blood also dried off already, and flies were here and there around my wounds. luckily i didn't bleed to death there. 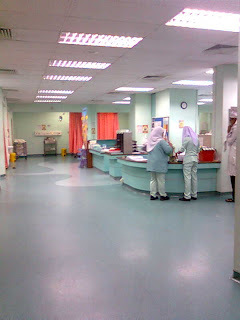 so, that concluded my first n last visit to University Hospital. hopeless place. I do not think this is due the lack of communication. The Doctor in attendance has admitted they have made several attempt to talk to the Management but was just ignored. They are building big Consultation Hall & waiting Lobby for just to show off ?? Seems like alot of people had a bad experience in this hospital. 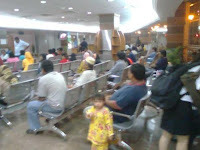 They built a big waiting lobby because they know there will be lots of patient waiting outside? It'll show what may happen to American hospitals if we have socialized healthcare, or as it should be called, healthcare rationing.